Image © DC Comics. Written by G. Willow Wilson, art by Xermanico, colors by Romulo Fajardo Jr., letters by Pat Brosseau, cover to Terry & Rachel Dodson. This issue clicked for me, it’s my favorite so far of the story arc. “The Just War Part 4” takes us mostly out of the battle and into the presence of Aphrodite, who not only doesn’t know why she’s here on this war-torn island, she doesn’t even want to be the goddess of love anymore. Not where I expected G. Willow Wilson to go, and that makes it more interesting. 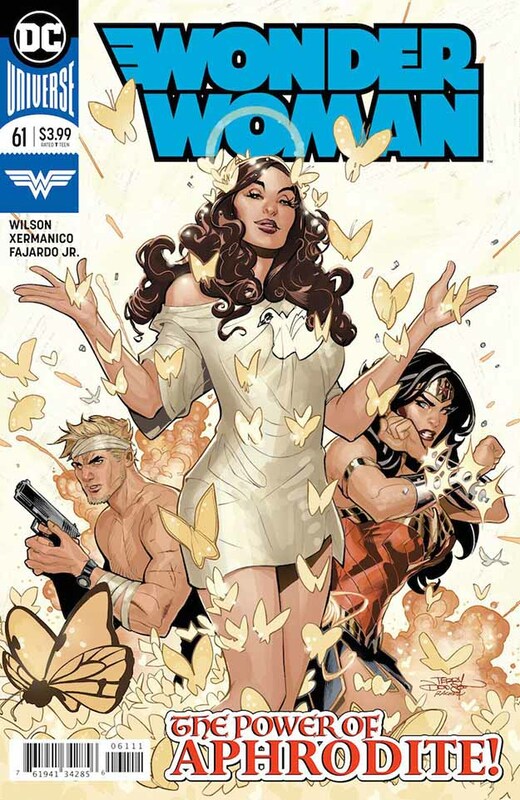 She and Steve Trevor have a fascinating debate while she heals his wound, and elsewhere, Wonder Woman is saving the grandchildren of the Prime Minister. If she can get them all to an arranged meeting place, a truce may be possible…or maybe not. Well done, liked the art and everything else too. Recommended. This entry was posted in Comics, Reviews on February 5, 2019 by Todd.